Geraniums are often used as container plants or planted as annuals. They naturally grow in hot climates (zones 9-12), but that doesn’t mean they have to die off each winter in colder climates. Your geraniums will last for many years if follow this simple technique for overwintering them. Dig your geranium before the first frost. Carefully dig around and under your plant. Try not to severe any major roots. Remove your geranium from the ground and shake the dirt off. Shake off the dirt and rake through the top of the plant with your hands to remove any loose leaves. Inspect your plant for moldy leaves or rotted stems. Clip them before overwintering so they won’t spread to other parts of your plant. Place your bare root geranium upside down in a cardboard box or paper bag. You can put multiple geraniums in one box, but be sure not to pack them in too tightly. Packing upside down helps to retain moisture in the roots when overwintering geraniums. Close up your box and store your bare root geraniums in a cool, dry place. Your geraniums will overwinter best in a dark, cool area. 45-50 degrees Fahrenheit is an ideal temperature. Without light, warmth or moisture your geraniums will go dormant and “sleep” until spring. Basements are an excellent place to store your geraniums. Keep your box up off the floor to discourage mold. Do not tape your box. Instead, fold it loosely to allow for a little bit of air flow. Remove your geranium and prepare it for replanting. When spring approaches, its time to take your geranium out of the box. You might find that your plant looks shriveled and dry. Its very common for the leaves and upper branches to dry out. As you move closer to the roots, you should run into some green stems. If you are not seeing any green, don’t panic. Choose a branch near the bottom of the plant and gently scratch the top layer. You should see green underneath the top layer of “bark”. Prune your geranium to remove the dried branches. This may mean cutting it back completely. Don’t worry in 4-6 weeks you should notice new leaves emerging from the soil line. Allow your geranium time to wake up before moving it outdoors. Its a good idea to pot up your geranium and keep it in a windowsill for a few weeks before moving it outside. Pre-moisten the plant before potting it. 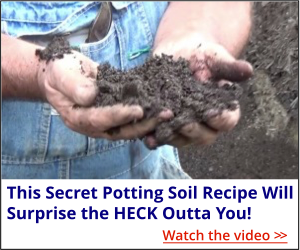 Do not over saturate your soil. When you squeeze the soil it should clump easily, but no water should run out. When potting a dry plant, our first instinct is to douse it with lots of water. Resist the urge to over water it. Let the tops dry out slightly before each watering. I WISH YOU WOULD REQUIRE THE PEOPLE THAT COMMENT ON HERE TO PLEASE TELL WHAT STATE THEY LIVE IN. IT MAKES A LOT OF DIFFERENCE IN WHERE SOMEONE IS GROWING SOMETHING IN THE NORTH AND SOMEONE IN THE SOUTH TRYING TO OBTAIN THE SAME RESULTS. We do that in our members area, http://backyardgrowers.com/join. In the members area that is part of a required signature so can answer questions correctly. Hi, live in South Africa and my geraniums are looking tired, we having a very hot summer. Water them regularly, what do you think I can do to make them get better? Give them an application of liquid fertilizer made for annual flowers. Miracle grow or Jack’s would be fine. Love this! I collect succulents as a hobby and they go dormant for months. I’m going to put my “pretty” geraniums with them. There is a geranium that form a large base that people like me collect 🙂 and do the same thing. It just never dawned on me that the regular staple could do the same thing. Thank you! I just happened across this post and wondered if you have tried this method with any other annuals. I have a few pots of mums I want ro overwinter but I’m not sure if I should just go the “cutting” way.. Thanks. Mums are perennials and are supposed to over winter outside in the ground. Some are not hardy enough, but they are considered perennials. I don’t know about the cuttings. They are way different than geraniums. will deer eat geraniums ? I can’t say for sure, when they are hungry enough they’ll eat just about anything. But that’s usually winter when they get in that mode. Yes, deer will happily eat the flowers…they don’t seem to bother the leaves. I have an ongoing battle with them. I don’t have a basement or other good place to store the box, but I have kept the same geraniums going a different way. Every spring I take a bunch of cuttings from the large plants on my window sill. I have found it works best if you stick a small cutting directly into potting medium, rather than in water. Rooting powder is optional. Anyway, some always take. When spring warms up enough the big plants are moved outside to live out the season. They are allowed to just die at the end. I may take a few more cuttings if I have room for them. The best baby plants are moved into big pots on the window sill and the cycle repeats itself. Thank you Len, great advice. Last year I brought my whole pots in my garage with geranium and spiky plant ( maybe dracena)they did well and I’ll do it again this year, I just removed the spiller plant out and re planted another in the spring! The garage should be fine for Geraniums, but I would water them every few weeks. I started keeping my ‘spike’ plants to overwinter.., they were getting more expensive so I thought, why not? I have had some for years & years now. They turn into large lovely plants with woody ‘trunks’. I use them as houseplants in the winter and then plant new annuals in them every spring. I share this with all the gardeners that I know. ? Great information, thanks for sharing with us. I have done this for a couple years now. just put plant out in fresh soil come spring and they are as good as new. my spikes are almost 3 ft tall! My plants are green and lush but no flowers yet. Have fertilized them what else can I do. Just be patient and back off on the fertilizer, you want blooms, not lots of vegetative growth. Do not water them too much. If you let them dry out a bit between watering, they will panik and set flowers. I tried this after I read this last fall. It did not work for me. The plants were dead – no green on any of the branches. Disappointing but not the end of the world. I did keep some in pots and they are thriving and have been making cuttings from them so I’ll have a garden full again this summer. I need to know how to make cuttings of kong hong orches trees since they don t seed? Many thanks for this tip. I put out about 25 hanging pots with Geraniums, Ivy Geraniums, Verbena & calibrachoa on the porch. I’ll give your tip a try this fall, my basement runs between 40 – 55 degrees all winter. Would the same procedure work for Verbena and Calibrachoa or are cuttings more effective? I tried Verbeba cuttings last fall using sand, but they immediately sprouted mold inside the plastic bags and none survived even until Christmas. Any advice on what I might have done wrong or a better way to overwinter will be much appreciated. I’m in southern Vermont. Mike, I have to say this really works! Last fall I did this to my geraniums that had been in pots. Only I tossed them into an old plastic bag that I left open. Put them in my basement with the bag open. It was COLD where I threw them but can you believe – they put out FLOWERS in the bag! In spring, I took them out. pruned them back and planted them back into pots. Now they are blooming like crazy on my deck! 2 of the plants, however, dried up too much and didn’t make it. Will do the same this fall with them. I was so glad to receive this information. Wish I had known this many years ago when I had so many every year. I have one plant that I will work on in a few weeks. Thanks for the heads up. I always look forward to your next email. Hug my donkeys! Help!! I have several plants that have been in the ground for near onto a year, some planted last fall and some early spring. I would like to sell some of them this fall to make room for more. Should I dig when someone buys them or pot them up??? I know they will start to go dormant and loose their leaves but want them to look good when selling-caryopertis-longwood blue and dark knight, potentilla, spirea, weigela, beauty berry, hardy hibiscus, dappled willow. What are your thoughts on selling them in September???? We are in zone 5. Thanks so much for your site. Do you use the same method for IVY LEAF GERANIUMS to overwinter or have other suggestions ? Year after year, I try to overwinter these and fail miserably . the color of the flower is not the same like dark red after cutting and storing in winter. Have you ever grown peonies from seed? I have not, but Amber told me she grew them from seed easily. Would it be okay to prune knock-out roses at the end of the summer, about a foot from the ground? Pruning your Knockout roses at the end of the growing season should be just fine, I do it all the time. I was given a large geranium last mother’s day and brought it in the house for the winter. I put it in a sunny window and kept it watered all winter, then set it back out on the patio in the spring. I have taken several cuttings from this plant and re-rooted the cuttings. I now have several geraniums in pots and want to bring them in for the winter. I just simply hate to through them away ! !. My problem is – WHERE THE HECK AM I GOING TO PUT THEM !?!?! You answered my question. Thank you. Here in the UK, we’ve always used a much more time consuming method, which isnt 100% anyway. . Your way makes good sense, and I’m going to give it a go, thanks Mike. Thank you Mike, I will add this to my big thick Green three ring Binder called “Mike’s Wisdom”. I love geraniums and have lots of them to store. For decades, I have hung a wire across my basement ceiling, dig up all of my geraniums, shake the dirt off each, and hang the geraniums upside down over the strung wire (by one of the branches or roots coming off each plant). They look like dead sticks when I set them out in spring after all frost is gone, but after a couple weeks, I see new growth on all of my geranium “sticks”. My children think it is magic. I live in northern Indiana, my basement is very cool, but not cold and has zero light in this portion of the basement, but tends to have some moisture, so box-storage for bulbs and such tends to mildew. Thank you for the 45-50 F range so I can keep a better eye on the temperatures in the basement this winter in anticipation of another polar vortex. Hi Mike. Good information. It reminded me of my uncle who loved geraniums. He had all kinds, and he went through this process every year. I followed in his foot steps and love my geraniums, however, I don’t go through this process. Fortunately I have a large enough garage where I keep them potted. Don’t water them, keep the soil just about moist. On mild winter days in the winter I put them out to get some sun. When the sun is going down you have to be sure to bring them back in. If you don’t have a warm day, then don’t put them out. Winter cold will kill them for sure. I have a few from my uncle’s collection and they are over 5 or 10 years old now. All the neighbors had asked how I get them so big. Oh well, guess the secrets out now. All of my gerainiums are in pots. Should I take them up as you indicate,cover and keep in present locations, or haul them inside? I live in northern Ca. I would leave them in the pots and just bring them indoors. Hi Mike, What time of year should this be done in New England ? Thanks! At the end of the growing season, you want to get them inside before they freeze. I hope this works. I had tried a recommendation from another site that said to keep the bare roots and then soak them in water once a week. that didn’t work so i have just been bringing them in and then have to find a place to put them all winter. love your newsletters. Can this be done for any other plants or flowers? If so, please list. I’ve not tried this with other annuals. I will give it a shot with my annual vinca this winter and see what happens. What is there to lose? I’d have to replant them anyway. I don’t think the annual Vinca will make it through the winter. But, Vinca flowers set so many seeds, all you’d have to do is save a bunch (they’ll set WAY too many to save them all, unless you’re going to grow them for sale in the Spring), and plant them in early Spring indoors, or wait until thelast frost date, and sow directly outdoors where you want them.